Well that time of year is right upon us once again, yes I am preparing for this before Halloween since I won't be here this Halloween. There are so many horse owners and lovers who take pictures of them with their horse(s) at the holidays and I would tend to think that very few would not like professional photos of them with their equine partners at this special time of the year for them to keep and look back on for many years. What better gift is there than treating a friend or loved one to some photos with their horse(s)? Would you like to give someone a photo shoot and have them book it in their own time? Contact me about my "Gift Vouchers". This is not a limited time offer, gift vouchers will be permanent. I understand that 2018 has been a rather difficult year for many people. 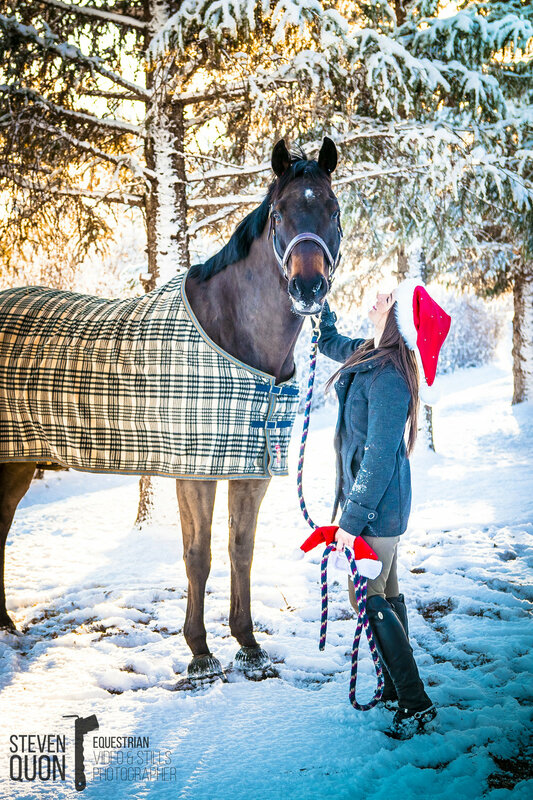 The economy in Alberta still isn't where it should be and I don't expect everyone to be able to drop a bunch of money on a Portraiture photo shoot this Christmas as it's probably not seen as a priority but I want to get you great photos of you with your horse(s) this Christmas. So just a friendly reminder that I do have what I call a "SPECIAL BOARDER'S PACKAGE", which many of you aren't aware of. I have offered this since day one but it has really flown under the radar. It is a group booking of FOUR people, total 2 hours in a single outdoor or indoor location (half hour per person), 5 high res digital images for each person. Or perhaps you don't want to be in the pictures and you just want pictures of your horse(s), even dressed up in Christmas attire? I offer that as well, Equine Portraiture: Classic - Just Horses. My photos can be customized and ordered as large as 24"x36" for you to do prints off of and frame it to loved ones as gifts. For more info on photos of just your horse(s), click HERE. Want to include your cats, dogs and any other pets that you may have in your photoshoot? They are more than welcome. Group shots with friends and family? Contact me about pricing. I will do it all. No job is too big for me. Any questions, contact me any time. Yes it's still early but I wanted to get the ball rolling right away. Come December I will have limited spots as to when I can do these shoots but I will free up as much time as I can.